Burning the Candle Of Desire – at both ends! If I thought substituting “she loves me, she loves me not” with “go hunting, go hunting not” would give me another opportunity to go hunting I would’ve use that method back in the day. My wife and I were at the front end of raising a family, working as much as we could and juggling a schedule to squeeze more time out of the day and into our relationship. Challenges were among us as they are today but in a much different context. One thing for certain, my love of the outdoors had not changed and the ‘call of the wild’ was ever present. My wife appreciated the outdoors, as well. She was raised in a family that enjoyed hunting and fishing a lot. We spent a good many of our family vacations camping, hiking, biking, etc. Most of our favorite vacation destinations were ‘north of here.’ I was definitely bit by the Michigan Upper Peninsula bug a long time ago. My brother in law, Craig, and I had formed a turkey hunting club. He and I were the only members and our by-laws allowed no further membership. It required us to submit our applications on a partnership basis, reserving the same three days off each season, giving us two and one half days of hunting. Turkey camp called our names most every year. But because his mail arrived earlier in the day than did mine he always enjoyed calling me when the successful turkey permits arrived in the mail. Membership also had its privileges. You see, we would share camp with the senior membership of ‘fish camp,’ Roy and Bill. Roy is Craig’s dad, thus, my father in law. Uncle Bill is Roy’s youngest brother. We would arrive in camp to find both of them had already arrived, their duffle bags claiming their beds. We knew they were fishing a trout stream somewhere. They always brought home fish and a story. Sometimes the stories were from their childhood days of fishing these same hotspots. Onward, Craig and I wasted no time. We claimed our bunks for the duration, changed into camouflage, grabbed our hunt gear and hit the road. By the time the sun was settling a little low we had spotted a few turkeys but no gobblers. So with time being of the essence we shifted to ‘plan B’. It was Craig’s turn to drive that year so he dropped me off near a perennial roosting area and continued on. I knew where he was heading. He preferred to hunt this one spot even if he didn’t catch a clue. I once asked him if that spot had a name, kind of like his first girlfriend. Regardless, one of us needed to hear a gobbler or at least some tree talk. “Nothing!” We both muttered when he pulled up next to the downfall on the side of the road. The consolation was meeting up with Roy and Bill, knowing they’d caught supper and had them filleted. Sure enough our prediction was right. We both knew and neither of us would have bet against it. Win-win-win! The rest of the evening was spent catching up with Uncle Bill, making sure he and Roy had a highball setting on the coffee table between their recliners. The next morning always came early and with the sights and sounds of breakfast…as prepared by Roy and Bill. Coffee was especially good. With Roy being a retired dairy farmer and Bill a barber, those two patented the early shift. That day proved to be a bust for turkey hunting. Day two was a repeat performance. Craig and I were starting to self inflict pressure as we always claimed to never leave for home without a turkey for at least one of us. For the record, as of that day in time, we never stopped and purchased one, either. That evening my wife called and let me know she had to go into work a little earlier the next day, asking if we could come home before noon. With her brother, dad and uncle all in camp, I was the odd fella, meaning there was no room to oppose ‘the wife.’ I convinced Craig to let me drive his pickup back and he could catch a ride with his dad. I also convinced him I would not change his country music presets for classic rock. For the record I changed them all! When I left, Craig was still in bed. I kept my mouth shut because fish camp was already doing a great job praising his turkey hunting skills. My gear was packed in the pickup and ready to go. A handshake with fish camp and I was on the road. It felt good to be a little ahead of the clock on my return trip. It meant I was able to stop at an Amish bakery on the way home. Having a loaf of cinnamon bread at home for maybe a couple of days kept turkey camp alive in my mind and my wife enjoyed it, too. (The bread, that is.) I had been driving about 15 minutes when I realized I had left my shotgun in camp. I drove another two minutes to realize it was in my best interest to return and retrieve it. As I drove back into the driveway I could see Roy, Bill and Craig all hovered around the tailgate of Roy’s pickup. Of course the story had to be retold. Craig tried to tell it but realized it was best told by our newest member of turkey camp, Uncle Bill. Uncle Bill, like Roy, had a contagious smile. Their eyes sparkled, the smile lines were big as ever and you couldn’t help but join them. With his adorning smile Uncle Bill began to explain the ‘morning hunt’ as follows: He and Roy were outside raking leaves around the cabin. He had heard Craig and I talk about the owl call to locate gobblers. Each year he asked us to repeat our “who cooks for you, who cooks for y’all” chatter. Sometimes it caused a gobbler to respond. It always got a chuckle out of Uncle Bill. Apparently Uncle Bill went into the cabin and found the owl hooter on the counter. He went outside to do his best imitation. They say a barber can carry a conversation with anyone…even a turkey! Uncle Bill went and rousted Craig and told him to bring his shotgun. 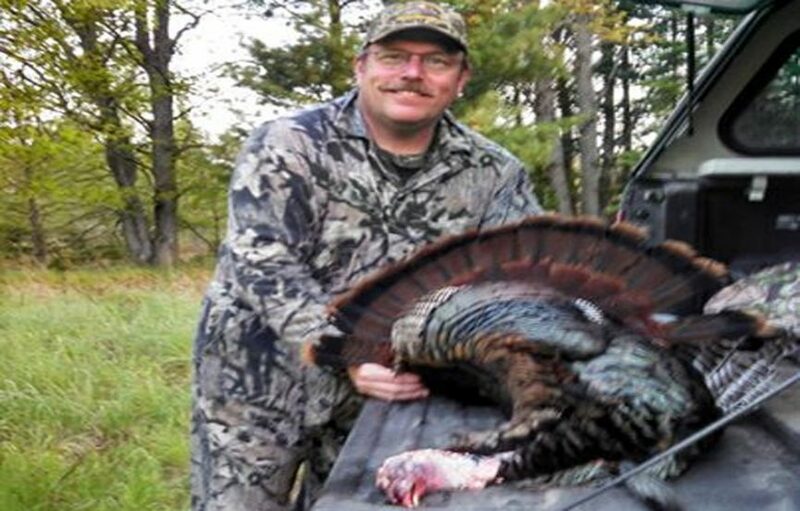 Craig sported his blue jeans, turkey jacket and shotgun with a couple shells in the other hand. As he got to the edge of the driveway the gobbler again exploded. Craig disappeared into the timber. A few minutes later…boom, boom. Craig then reappeared to the edge of the driveway. Uncle Bill said “I think he was still half awake…his boots were on the wrong feet.” We all fell apart in laughter of the embellishment. Damn if I looked down and saw Craig sporting his hunting boots on the wrong feet. Roy then reminded me that if I planned on coming back turkey hunting next year I better hit the road…again. That two hour drive was joyous…listening to some classic 70’s and rehashing another successful turkey hunt. Yes, I remembered the cinnamon bread!